Broan Dehumiditstat DH100W humidity adjustment setting. If it is desirable to control an exhaust fan based on the moisture level in a room, this two-wire surface mount wall control makes that possible. 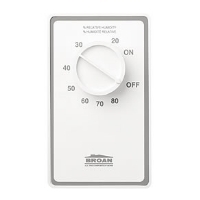 This control allows the setting to be adjusted from 20 to 80 percent relative humidity. The color is white. Suitable for use with most exhaust fans, including the Fantech and Panasonic exhaust fans offered by Energy Federation. It may be used as either a line voltage (120V) control or for low voltage (24V) applications.